A lot of the talk in the personal finance community right now centers around people’s stance on cryptocurrencies. I have seen a lot of investors and bloggers talking about moving some of their money into cryptocurrencies like Bitcoin or Ethereum. I have seen others talking about the reasons why they won’t invest in cryptocurrencies. I have one simple reason why I’m not investing in cryptocurrencies: I invested in mining cryptocurrencies instead. Until four months ago, I had never built a computer before. Building computers is for nerds, gamers and engineers, right? I always thought so, until I started to understand that I could build a computer that would literally make money* for me every second of the day. *The jury is still out on whether we call cryptocurrencies money. But I can exchange what I mine for good old US Dollars, so I’m calling it money for now. What does it mean to mine cryptocurrencies? Explaining the ins and outs of cryptocurrency mining is far beyond the scope of this article, but I’ll give you the very high level overview, then get into my story. Cryptocurrencies like Bitcoin, Ethereum, and other “alt coins” are built on a blockchain, which is essentially a ledger that is maintained by a network of computers around the world. Those computers each do a certain amount of work to verify transactions on the blockchain, which is basically a record of who paid who in these digital currencies. If I commit to paying you one Bitcoin by sending it to your wallet address, that goes on the record, then it is validated by thousands of computers around the world. Those computers are called “miners.” This is essentially what I built. A computer that verifies transactions on the blockchain by doing math problems 24 hours a day, 7 days a week. How did I start mining cryptocurrencies? I’ll start with the disclaimer that I am by no means a techie. I use computers frequently, but mostly with web-based programs and the standard Microsoft Office suite. I got into cryptocurrency mining because I started to hear a lot about Bitcoin, then Ethereum, then a couple other currencies that were dramatically increasing in value. My first reaction was to buy. I put a few hundred dollars into Bitcoin and Ethereum using Coinbase, which was surprisingly easy (that’s an affiliate link and you’ll get $10 free when you make a purchase). My second reaction was to research and figure out what it is that I was actually buying. NOTE: if you are going to follow this path, do those two steps in reverse. As I started to do research, I got deeper into understanding cryptocurrencies. I learned about blockchains. I learned about instant payments to anywhere in the world. I researched regulation. I read up on the history. I looked at price trends to see if I could figure out how to invest profitably. None of this was as time consuming as it may sound. Eventually, I started to go down the path of figuring out how to mine cryptocurrencies. This is typically the first question I am asked when people walk into my closet and see the monstrosity that I call a computer. The answer is no. Again, to keep this article straightforward, I won’t go into the specifics of why it makes more sense for me to mine other cryptocurrencies, but basically, it is a whole different ballgame to mine Bitcoin versus other coins. I am currently mining combinations of Ethereum, Zcash, Monero and Hush, depending on what happens to be the most profitable for me at the time. Once you do a bunch of Googling and watching YouTube videos, it’s actually not that hard to put together a computer that mines cryptocurrency. In fact, most computers that are built for gaming are already capable of mining. The main determining factor is in the type of graphics card that you have, since that is where most of the work is done when mining for Ethereum or similar currencies. What I built is a Windows-based (yes, that Windows), 6 GPU Nvidia mining computer. This means that it is a standard computer with six graphics cards (where you would normally have just one, maybe two). I bought all of the parts on Amazon. This included a motherboard, memory, graphics processing units, a processor, so on and so forth. With the help of a friend who is slightly more technically inclined than I am, it took me about three hours to put together. This included the time to install all of the software and actually get the mining part of it up and running. By that afternoon, I mined my first share of Ethereum. That computer, which I named “The Big Rig” has been mining non-stop ever since. Is this actually worth mining cryptocurrencies? I will keep the answer to this question fairly short, because there are a lot of considerations that go into it. Profitability can fluctuate based on the price of the cryptocurrency, the “difficulty” of the mining algorithm, the cost of your hardware, etc. For me, my original mining rig cost roughly $2,400 to build. This included some non-computer costs like a power monitor to determine how much power I was using and a keyboard and mouse that I don’t leave hooked up to the computer (because you don’t need them). That computer (Big Rig) has mined an average of about $300 per month since I’ve been using it. I have left all of that money in cryptocurrencies, exchanging some for Bitcoin and leaving some in the coin that I mined. My power consumption for that computer totals around $96 per month (based on the energy monitor that I use and my current energy prices). There are no other costs associated with running the machine, beyond the power and building the computer itself. If you take the $300 per month and subtract $96 per month for power, that leaves me with a monthly profit of $204. This would mean that it will take me a little over 11 months to pay back my original investment. For many people, this doesn’t immediately appear like a worthwhile endeavor. The way that I look at it, if I could buy a house for $240,000 and get paid $20,400 per month in rent, I would do it in a heartbeat. I know there are many differences, but you can see where I’m going with this. Ultimately, it all depends on the price of cryptocurrencies, which I happen to believe will increase over time as they become more mainstream. Since I am leaving my mining earnings in cryptocurrencies, this pay back schedule could change dramatically if say, the price of Ethereum goes up by 20% (not impossible). If nothing else, the paid off computers still have value, as you can sell the components to gamers or others who build computers. Overall, I have decided that it’s a worthwhile investment for me. How do you decide what to start mining cryptocurrencies? I use a site called whattomine.com that breaks down the profitability of certain cryptocurrencies based on current price, hashing rate, difficulty, etc. What do you need to build a computer? This is probably beyond the scope of this article, but there are about 10 different components that you need to build a computer to start mining. 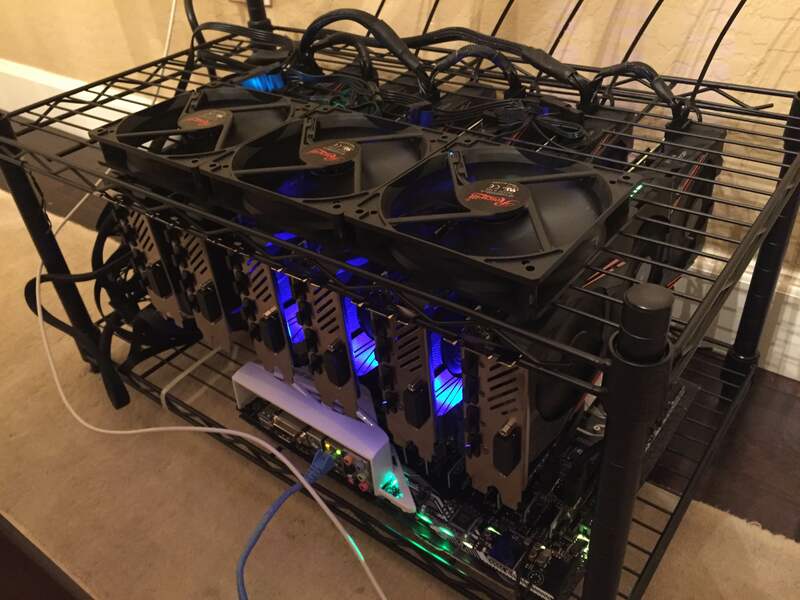 Here’s a pretty decent overview of a 6 GPU mining rig build. Is this legal? Yes. While it’s conceivable that it could be regulated in some way (not illegal, but regulated), there is nothing currently preventing ANYONE from doing this. Is there a cheaper way to do it? Yes. You can start with a simple computer instead of building out a full mining rig. If you have a computer with just one graphics card (like a gaming computer), you can mine profitably. I would not recommend trying to do this with your regular laptop, but you also don’t have to invest thousands of dollars either. There are gaming computers on Craigslist or OfferUp that you can buy for $500-$800 that can mine. Why wouldn’t you build way more computers and scale it up? I currently have three computers mining cryptocurrencies, but the challenge is the power consumption and the space. As you can see from my photos, these are not your standard desktop computer. I can only have two of them running on the same circuit in my house (my wife’s hair dryer killed the power in my house last weekend). They also give off a lot of heat, so I wouldn’t advise sticking one behind your child’s crib or under your bed. I have explored renting an industrial space and building it out, but it’s a large investment and I haven’t pulled the trigger yet. Hopefully this has helped to explain why I am not currently “investing” in cryptocurrencies, at least in the traditional sense. If you want to ask any questions, tell me why this is a horrible idea, or chat about the future of fake money, feel free to leave me a comment or send me an email. Not to burst your bubble, but you do know it’s not really anonymous and the IRS guidelines cover mining, right? You’ll be required to record the mining payouts as revenue in USD, regardless of how long you hold the crypto asset. This price also sets your cost basis. Finally, if you liquidate to USD then you also need to record your gain/loss. You’ll be able to write off equipment expenses and electricity against the mining revenues. I did all this back in 2013 and the tax complexity was enough to convince me dollar-cost averaging into a position essentially works out the same, or better because I’m not stuck with the bookkeeping and the quickly-obsolete hardware to flip on Ebay. Of course, do what you want, but just keep in mind the IRS will probably come knocking and claiming ignorance isn’t a solid defense. The IRS guidelines are quite clear. Great point. I actually met with my accountant when I started doing this to make sure I understood how it all works. While it’s a bit unfair to compare today’s prices to 2013, it’s still an attractive investment when you consider the profit/payoff time after expenses and capital gains taxes. Of course, this could change tomorrow based on cryptocurrency prices. It’s certainly a headache when it comes tax time, but I’ve found a few tools that make it far easier in terms of finding and documenting the price of currencies at a given time and the taxes owed on mining and trades. I appreciate you helping to paint the full picture though.